Self contained apartment on ground floor with garden terrace, sleeping two people in either twin beds or a super king-size bed. Manton Lodge Farm is a beautifully-positioned 18th-century stone farmhouse set in more than 100-acres of privately owned rolling grassland in rural Rutland. It nestles in a fold in the landscape and boasts far-reaching views across the Chater valley. The property lies on the edge of Manton village and is a short distance from Rutland Water. The Valley View Apartment is located on the first floor of the modern southern wing of the house, overlooking the garden, and has unrivalled views. It is accessed by a separate entrance at the side of the property and offers easy access to the garden. The accommodation comprises: Master Bedroom – available as either a super-king double or with twin beds – with flat-screen TV; open plan ‘Suite’ with sofa-bed (available as a bed for an additional guest) and small dining/seating area; En-suite Bathroom with full bath and over-bath shower; Fully-equipped galley Kitchen with combination microwave oven, fridge, 2-ring electric hob, toaster and kettle; and washing machine. It is centrally heated throughout. The Garden Apartment is located on the ground floor of the modern southern wing of the house, overlooking the garden, and has direct access to the terrace via a French door in the bedroom. It is accessed by a separate entrance at the side of the property. The accommodation comprises: a light and airy Double Master bedroom (available with either super-king double or twin bed set-up) with flat-screen TV; Kitchen-Diner with fully equipped kitchen including four-ring electric hob; microwave, fridge, wall-mounted flat-screen TV, armchairs, dining table and dining chairs; large modern en-suite bathroom with bath and over-bath shower. The Master bedroom has a French door opening directly onto a delightful stone terrace with seating area overlooking the garden and with wide views of the Chater Valley beyond. It is centrally heated throughout. Free broadband Wi-Fi is included. The Garden Apartment offers wheelchair access. A wonderful feature is the property’s acclaimed garden. Developed over more than 40 years by the current owners, it is open regularly as part of the National Garden Scheme and has been featured in Rutland Pride magazine. It extends to more than an acre of lawns, flowerbeds, York-stone terraces, shrubberies, stepped walkways, and kitchen gardens. Features include specimen trees, stone statues and urns, rose gardens, and an ornamental pond with fountain. With a dazzling array of different blooms it’s a blaze of colour throughout the growing season and of course acts as haven for birdlife. Beyond the gardens the landscape is grass pastureland – filled with lambs in the spring – which rolls away to the little Chater River at the bottom of the valley. Several thousand trees have been planted in the past few decades creating some interesting walks through the various spinneys and copses. The garden is easily accessed from the apartment. For those with longer legs – or a bicycle – Rutland Water is a short distance (1km) away offering a network of trails and a host of other activities and attractions including sailing, fly-fishing, bird-watching etc. The property is within easy walking distance of the Horse & Jockey pub in Manton which serves excellent food and from here you can pick up the trail around the reservoir. Well- behaved dogs may be accommodated on request. Caroline Burnaby-Atkins has lived at Manton Lodge Farm since the mid-seventies, raised her family there, and is now a doting grandmother to Eddie, Gabriella, Rollo and Sophia, all of whom enjoy visiting from their homes in London from time-to-time. Caroline is devoted to the maintenance and improvement of the large and beautiful garden at Manton Lodge Farm and welcomes guests to share the tranquillity and beauty of the rural location and its surroundings with her. Manton Lodge Self Catering combines well-appointed, modern-built accommodation, with the charm of a Rutland stone farmhouse. Surrounded by fabulous gardens full of flowers, and set in 100 acres of private land, it is an oasis of tranquility with fabulous views - Rutland at its very best. It is mid-way between the charming market towns of Uppingham and Oakham and just a few miles from glorious Georgian Stamford. It is three quarters of a mile as the crow flies to Rutland Water and offers easy access to its many activities and attractions including sailing, bird-watching, fly-fishing, the aqua park, osprey centre etc. A wonderful feature is the property’s acclaimed garden. Developed over more than 40 years by the current owners, it is open regularly as part of the National Garden Scheme and has been featured in Rutland Pride magazine. Extending to more than an acre , guests are invited to explore its York-stone terraces, stepped walkways, and intimate paths. Features include specimen trees, stone statues and urns, rose gardens, and an ornamental pond with fountain. With a dazzling array of different blooms it’s a blaze of scent and colour throughout the growing season and of course acts as haven for birdlife. Alternatively just sit on one of the many teak benches dotted about the place and soak in the surroundings. Refurbished bathroom with full length bath and shower over bath. Thank you for your kind review, just sorry that the people above were a little inconsiderate, not up to our usual careful guests, we too were not altogether thrilled with them. This property is a delightful gem in the Rutland countryside. Well equipped and comfortable, the flat has lovely views of the gardens and surrounding countryside and the proximity to Rutland Water was excellent. Although the weather could have been considerable kinder, the accommodation was comfortable and homely. The bathroom was superb and the very large double bed was extremely comfortable. The apartment was well apppointed and the host was available if required. The central heating was efficient and the place was very clean. 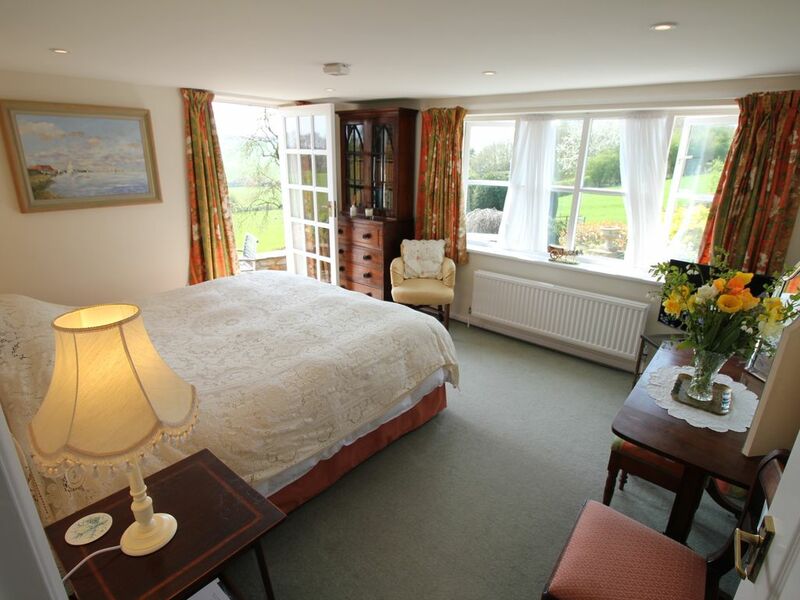 It was an ideal base from which to explore Rutland and we would recommend it to other holiday-makers. My husband I stayed here for 12 days in July, 2017. I was very pleased when we arrived.The pictures are exactly what you get. Beautiful flowers, gorgeous landscaping and such a peaceful place. Mrs. Atkins is a lovely person, very personable. We truly wished it wasn't time to move on. Sad to know we will not see Mrs. Atkins or her beautiful place again. Thank you both, there is a spot in the garden which is known as "Mickey's Corner", a lovely remembrance of you both-thank you. Have just come back from a week close to Rutland Water and I want to say how delighted we were with our accommodation in the Garden Apartment at Manton Lodge Farm. We were immediately hit by the magnificant views across the valley from the sitting room and bedroom windows and the glorious gardens around the house abundant with spring flowers. The apartment was all we could wish for with a well equipt kitchen and cosy sitting room. The spacious bedroom and bathroom was also a bonus. There are plenty of interesting walks around Rutland Water and if interested in sailing there was plenty going on at the Rutland Sailing Club. Also of great interest were the Barnsdale Gardens where we spent some 4-5 hours. If you like the great outdoors and self catering in a natural country setting do give Manton Lodge a try. You will get a warm welcome. Everything was exactly like the pictures. We stayed with our very old dog in tow in the Valley View apartment that definitely lived up to its name, rolling country side views from all the windows and a most spectacular well stocked garden that was a pleasure to stroll around. The apartment was well furnished and very clean. Kitchen was small but functional for a short break, missed not having a full cooker but gave us a good excuse to eat out! The huge comfy bed gave us some good nights sleep too. Lots to do around Rutland and some great walks. Stamford is definitely worth a visit and not far away. Fantastic setting to unwind & relax in, Caroline was a great host and would recommend the place to friends & family. Manton is on the edge of Rutland Water, the biggest man-made reservoir in Europe, hosting a wide range of leisure activities including fly-fishing, sailing, cycling, bird-watching, golf etc. Short stays please IGNORE! above nightly rates and enquire direct Birdfair 3 nts £380.00 Additional nights £60.00 Burghley 3 nts £380.00 Additional nights £60.00 Christmas and New Year flexible Change over Mon or Fri Additional double/twin ensuite room sometimes available at £60 for the first two nights then £50 per night thereafter. Dogs at £25 per week by arrangement or £6pn for short stays.